Last summer while visiting my dad, I fixed his XP machine (Compaq Presario) since he was so unhappy with his new Windows 8 computer. See that story here. This visit, six months later, the XP computer wasn’t working again. It had no power. So to repair it, I replaced the power supply and and, voila, it booted yet again. Despite its advanced age, it keeps chugging away with a little computer repair, okay, to be more accurate, a lot of computer repair, now and then, well actually, every few months. The old power supply was only a few months old and it had already gone kaput. 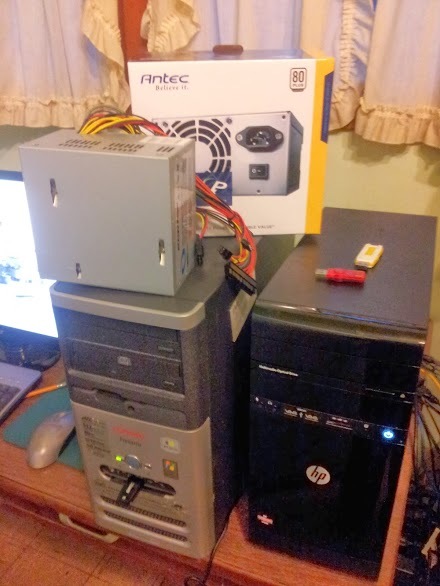 This time I bought a more quality power supply, an Antec, and a new surge protector since it may have been a power surge that killed it. I like both Antec and Thermaltake. They are quality power supplies. This sounds like more of a hassle than it really was, since to buy the power supply I had to (I had to!) go to Fry’s Electronics, a huge computer store that I enjoy. Once the power supply was installed, I noticed the hard drive was making a horrible noise like grinding metal mixed with groaning, (I think it was haunted) so I decided to replace it again too. So, oh no, I had to go Fry’s again. But then I remembered, Fry’s doesn’t stock used or new IDE drives any more. So I drove to another computer store, not as big as Fry’s but still fun to go to, Micro Center. They had a variety of refurbished IDE drives. How you refurbish a hard drive, I don’t know since you can’t open them. Maybe they just test and wipe them. Anyway, instead of a Hitachi I bought a Seagate this time. I cloned the Hitachi by attaching it with a usb to IDE adapter and making an image, then putting the image on the new to us Seagate drive. And the XP is good until my next visit. If I had bought a better power supply on my last visit, I may have prevented this repair job. It’s hard to say about the used hard drive, any brand could go bad after several years. Definitely, I should have replaced the surge protector, since that protects the computer and all devices on it. My point is this…don’t skimp on computer parts….quality parts last longer and reduce your computer repair bill over time. Saving money today can mean paying more in the future. Always use a surge protector and replace it once a year or so. They only protect you for one power surge and then they need to be replaced. At Ducktoes, we try to find a balance of quality and cost with computer parts and repair to give you the best computer repair service in Calgary. We also advise you on the best maintenance practices to extend your computer’s life and your cost.